On Monday 24th September RUCST hosted a Macmillan Coffee morning in partnership with Edlington Community Centre’s slipper swap event. The morning saw around 60 people attend to share coffee and cakes and have a good chat. 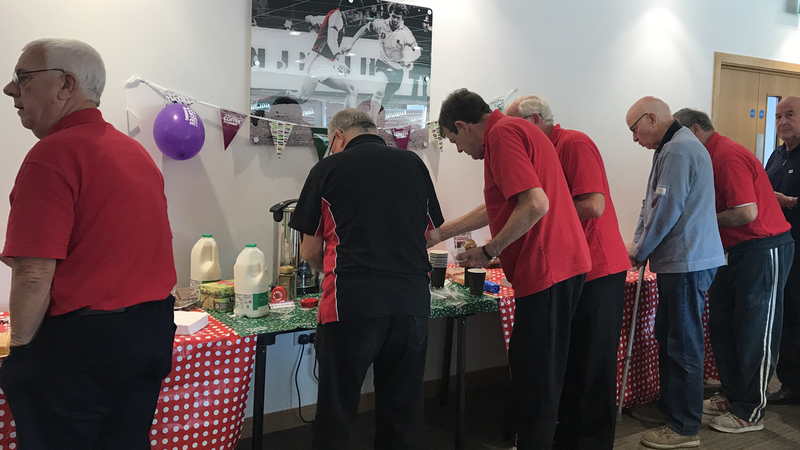 Participants from the Mature Millers association, Rotherham’s Military Veterans Centre, RUCST’s BTEC level 3 students and general members of the community enjoyed goods baked by RUCST’s staff members (or their mums)! The morning raised £133 for Macmillan Cancer Support. The ladies from Edlington Community Centre hosted a slipper swap, with over 40 pairs of brand new slippers being exchanged for old ones. The new slippers which aim to reduce the risk of falls, were accompanied by information and gadgets to keep safe at home. Thank you to everyone who donated and attended. If you would like to find out more information or get involved please contact eschofield@rotherhamunited.net. Members of the Rotherham United Community Sports Trust’s National Citizen Service hosted an Easter themed bake sale and raffle at Rotherham Hospital to raise funds for The Rotherham NHS Foundation Trust’s youngest patients. Libby Meadows and sisters Lauren Hollingsworth-Smith and Mia Hollingsworth-Smith of Wath Academy sold a host of cookies, cupcakes and chocolaty treats and raffled a giant bunny, a chocolate hamper, Easter eggs and a home-made celebration cake. They raised £252.27 for the Rotherham Hospital and Community Charity’s Dr Ted children’s appeal. HOLIDAY CAMPS | Day 8 our last day of camps. Thank you to all our children and families who have joined us either at Parkgate Astro or our Wickersley location. We hope you have had just as much fun as we have. See you all in 4 weeks time on our Spring Bank Holiday Camp. BOOKINGS NOW OPEN ONLINE.